Copyright 2002 M.J. Sklepkowycz. All rights reserved. 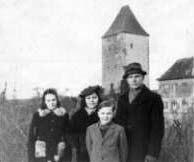 In March, 1946 we were in Dinkelsbuehl, Bavaria (near Augsburg, US Zone) and I was almost ten years old. It was a town much like Nordlingen where we had been living, with a wall around it and a moat around about half of its perimeter. This was part of the Werniz River. Downstream of the town was a concrete dam, six to eight feet wide, and when the water was low the dried sediment on the dam surface looked like dried, cracked toilet paper sediment. In the summer, the water was chocolate brown. Perhaps it was treated, as it reminds me now of the water that bubbles up at the outflow in 25 feet of water in Ashbridges Bay in Toronto Harbour when I pass it to go salmon fishing. This is from the Toronto sewage treatment plant. At any rate, we swam in it, and caught fish (must have been carp, but a pike was seen in the water below the outflow of a nearby mill) in the moat outside the town wall. George Kapy and I did that. Once he fell in the water and caught pneumonia! Must have been spring, and cold water. We were not aware of any fishing seasons! 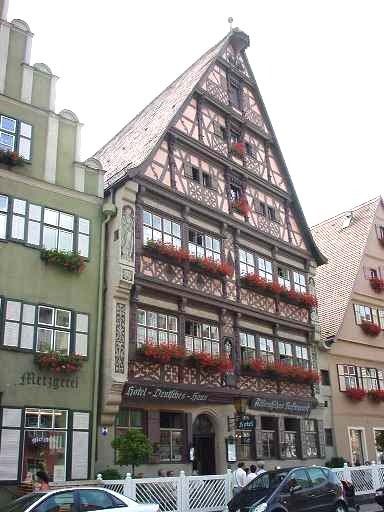 The Deutches Haus hotel was Camp #2 and the Goldene Kanne inn was #5. Speaking of falling in, we were on the Werniz (perhaps Wernitz) in the spring, curling. We made curling "stones" by cutting a slice of wood off a log and attaching a handle to it. The ice was six inches thick, or better, but some of the water was open and we were on a slab attached to shore. Of course our activity on the ice soon made it separate from shore and the current started to move it out. Everyone ran, and I was the last to jump. But not quick enough, and I was shoulder deep in very cold water. It was probably about one and one-half miles home, but I survived with no ill effect. Dinkelsbuhl (the 'u' is an umlaut and has two dots over it) was over 1000 years old. 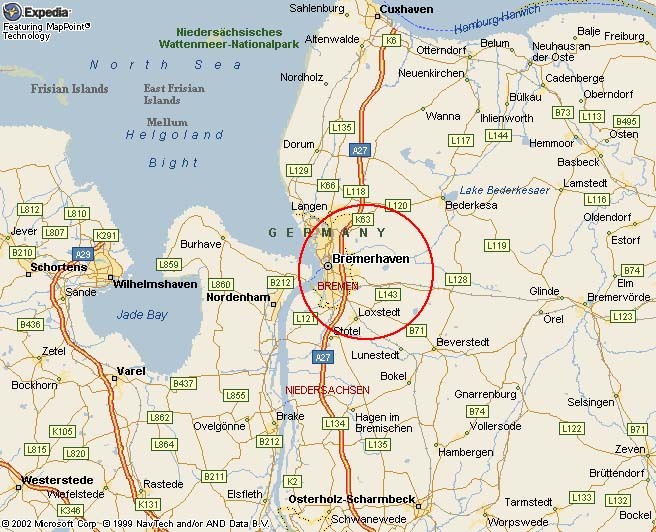 During 1632 the Swedish had surrounded the town and were threatening to wipe it off the map. Apparently a young girl who served in a kindergarten teacher capacity gathered up all the little children and went to the Swedish commander to try to persuade him to leave. Moved by all the little kids, he did. 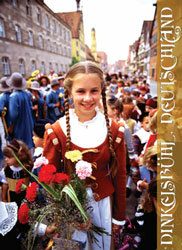 This event (Kinderzeuche) is celebrated each July and is quite a colorful event. Everyone dresses in period costumes, including the setting up of a "Swedish" camp outside town, complete with armour clad soldiers. There is a parade, cannons are fired (the old ones!) and so on. I found a cannon inside a building and noticing the "flash hole" clogged by black powder residue, so I cleaned it. I wonder if that one was dirty from a firing in 1946 or 1046? The town has a regulation that all repairs and construction have to be done to match the 10th century look, and it is. 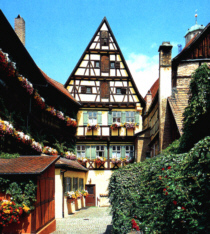 The buildings are all "Tudor" type, with sharp angled roofs, and topped with clay tile. Streets are all cobblestones and you can get in and out of town only through gates, with towers above, at the wall. Most of these had a bridge over the moat just outside, though no longer lift bridges. The towers I checked out had nothing inside save hollow stairways to the top. There were some "street people" types living in one of these towers. There were occasional very small doors through the wall for access to gardens outside, but not many. There was not much of anything growing inside the walls, but outside there was a lot of greenery. Perfect postcard scenery, and there was a lot of painting and drawing done. I even did some, and some of it survives. A couple of miles out of town was an old flying school, then not in use. We were all allotted a small plot for a garden. This was probably part of a grass runway! Someone was growing tobacco in the back yard of our camp. There was a small garden there as well. We, the kids, went blueberry and mushroom picking in the woods past the (Fliegerschule) gardens. There were lots of both, and the mushrooms were easy to identify. The 'other' ones were the red topped toadstools you see pictured in nursery rhymes! On one such excursion, George Kapy and probably John Dozorski and some of the Ciupkas (Jerry 'Slavko', Taras) were with me. The Ciupka kids all wore "shlapaky" in the summer. The soles were cut from old tires with straps nailed to them for their feet to go into. We started picking blueberries, then someone said that there was soccer being played on a field in the woods, and everyone decided to go there. As I was not interested it that, I continued to pick berries. Then I got lost. I walked all day and after circling Dinkelsbuhl, passing through a couple of neighbouring villages, came back to town from just about the opposite side. I had caught myself walking in circles, and tried to correct that, then found a cart track and followed that. I cried, prayed and everything! Left: From left, George Kapy, me and Taras Ciupka with some rabbits. More are seen in the cages behind us. This was in the back yard. Right: My sister Zenovia in her Ukrainian costume in the cemented side yard at 52 Nerdlingen St. The street is behind her. The Germans loved to hunt. One building I was in, another DP (Displaced Persons) camp, was built like a motel (which it had probably been), with long corridors on one side. The corridor walls were lined with deer and stag antlers mounted on wooden plaques. All the "Gasthauses" in town had antlers as part of their decorum. 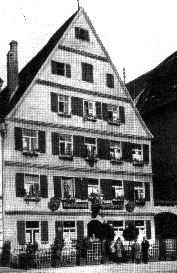 The Gasthaus was an inn, with rooms for rent and alcoholic beverages were sold. Probably just beer, in most. The beer was low in alcohol, and we kids used to go in and have some. It cost ten pfennig, a pfennig being the smallest part of a "mark". Butter was freely available now at 250 marks per, probably half a kilo, if I remember the size of the brick correctly. This in US Occupation money. I guess this was 'big bucks' if you take into account the price of the beer and a train ride to the next town were both ten pfennig. The Mark bill was about 2 1/2" x 4". Deutsche Marks were dead! The inns were just what you would see in a "Three Musketeers" movie, with thick wooden benches and tables, lead glass windows and heavy stairs leading up to the bedrooms. The beer, and something called most, a pinky sweet beverage, which was probably a cider, was served in tall steins. They both cost the same. We loved it! The locals would sit around, drink beer and eat shpeck (a slab of bacon) and black bread. They had a piece of the bacon on a little wooden cutting board and would cut a square off with a little staghorn handled, pointed bladed knife. This knife was part of the lederhosen leather pant outfit. There was a little pocket sewn into the cuff, where the side seam was. The knife was carried there encased in a silver mounted black leather sheath. I foolishly sold mine at a gun show in Toronto! Most males wore an uller, a thing just like a key fob on their belt or belt loop, on the front of their body, and just to the side. The uller could be the image or carving of a coat of arms, or just about anything. The sharoten (an alpine, creamy white, delicate flower, portrayed sort of like our trillium), carved out of staghorn was popular. The crosspiece on lederhosen suspenders always had one of these sharoten for a decoration. There was a bakery down the street that would bake for you. I would go there, borrow a large baking pan and my mother would make something up, I would take it there, have it baked, and return the pan. It was a good deal, and we did it regularly. UNRRA was now feeding us. There was an UNRRA representative to look after us, a Ms. Colley (spelling?). There was fresh baked French bread - which was WHITE, something that we rarely had till now! The regular Eastern European bread was a sour black brick, which was probably exceptionally good for you, but I hate sour black bread to this day. We had black bread here too, but it was not as sour as the stuff 'back home'. A treat here was to spread some lard on a piece of bread and sprinkle it with sugar. Another food was to toast black bread in a frying pan with lard in it! Cholesterol heaven! I could not figure out what the flakes they gave us were till I saw Pabulum in Canada many years later. Peanut butter was unheard of, and I just ate it with a spoon. Dried French fried potatoes, or were they just dry potatoes cut like 'fries, came in about a two gallon square metal can with a round pop-in lid. I don't think anyone figured out how to cook them! There were Planter's peanuts, and I liked them, but had no idea what they were. Same thing for gum, the first taste of it was from my American Red Cross package (more on that later). What on earth is this stuff? What is it made of and why would you chew something you did not swallow? There was a small room in the compound, which served as our supply center. I would go there and would be given so many grams of this or that. I don't remember for sure how it was established how much I could have. I think we were given coupons to exchange for food. One day my dad made some sausage. Our heat was wood fuelled and the sausage was hung inside the chimney to smoke. Which reminds me of the time I watched someone kill a pig at the camp. He used a long knife and it was not a pleasant experience! Which reminds me of the chickens killed back in Czechy (my birthplace in the Ukraine). Hanka (my grandmother’s maid) would chop off their head and sometimes the chicken would thrash and slip out of her hand, running off without its head! Our camp had once been a brush factory at 52 Nerdlingen Strasse. The building we were in had two floors of usable rooms and three floors of attic (for the steep tile roof), with only planks with gaps between them for floors there. The four of us had a room facing the street. Beside us was a couple called Demkiw. She had worked for a farmer in Nordlingen and had a thumb cut off by a machine there. They also later (1951?) lived near us on Mitchell Avenue (#40) in Toronto. I don't know how I ended up looking there, but in the attic of their house were stacks of old 78 RPM records. These were probably some of the first manufactured variety as they were at least 1/4" thick, not like the later thin variety, and had a sound track on one side only. They would probably be worth a fortune now! 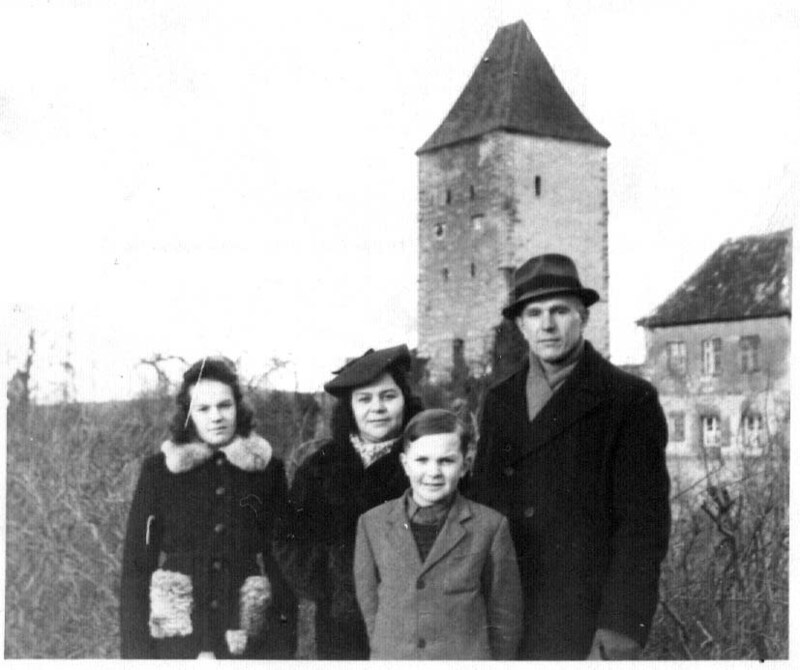 Next to them were George Kapy and his family (parents and Zenia, Nelly and George). I don't even remember if there were any other rooms across the hall. There was a long, narrow room with a toilet, and a cold water tap in the hall. No sink. In our room, there was a table in the middle, a bed for my parents to the left of the door, a wardrobe to the right, and a double bunk bed for my sister and I past that. 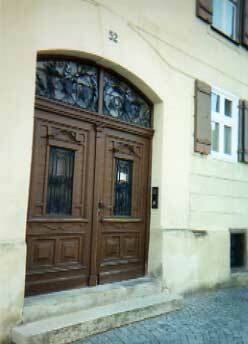 There were two windows (which swung out like double doors) facing the street. We had a Christmas tree between them for the holiday, and I mention that so I can tell you that we had real candles illuminating it, affixed to the tree on little holders mounted on alligator clips. My sister would wear my underwear. This bothered me to no end, but of course there just wasn't enough to go around! Left: I remember the kid on the left, but not his name. 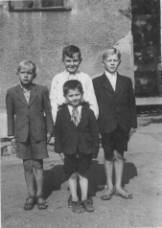 his brotheer Myron at the front. The ground floor had a "drive-through" with a big wooden door at the front, which led through the building to a small courtyard. There were a couple of rooms on each side of the drive-through. One was eventually used as a classroom for us, and Soloviy, the artist who painted the oil painting Zenia has of the woman and child with a globe. On the far side of the courtyard was a large building with many rooms and full of people. Its basement had a shower room full of showerheads in the ceiling, so a bunch of people could wash all at once in a group. Shades of concentration camps! This building had lots of couples that had set up family life and Fr. Ciupka held a mass wedding ceremony one day, marrying over a dozen couples. Some of the brides were ready to go into labour! We did have the necessities of life, but extras had to be obtained on one's own. To this end my dad would go out on bartering expeditions, as did most people. You would somehow get some cloth for instance. You could swap some with someone who had coffee or cigarettes, nylon stockings or chocolate, and swap some of these for something you needed. Of course this was true throughout my young years. Most clothing was made from something larger that had worn out. A skirt from a dress, a suit from a larger suit, and so on. Somehow Cousin George and I got our hands on a large quantity of lighter flints. 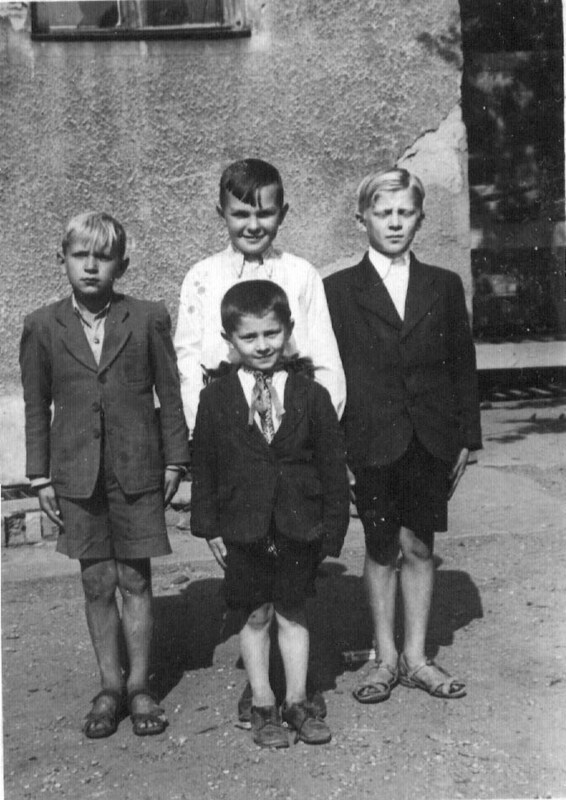 For ten pfennig (cents) we would take the train to one of the neighbouring villages. There we would go door to door to the farmers and swap a flint for an egg or two to beef up the family larded! What were YOU doing when you were a kid? The farmers here, as at home, were not scattered over the countryside like in North America. They gathered in villages, with their land surrounding these. Probably a leftover from times when safety in numbers was a valid way to protect you from the Mongol hordes. 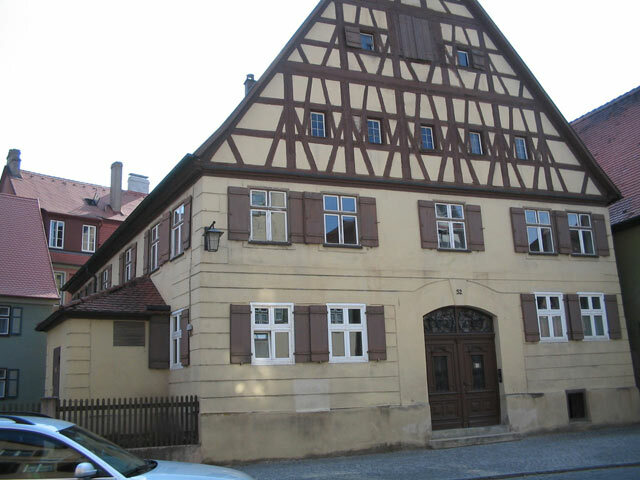 Our area farmers lived in Dinkelsbuhl. Each house that was a farmer's home had a drive-in gate to the street, a heavy wooden door, and horses, oxen and cattle were kept there. These houses were quite large. They would live above the barn so to speak. The stalls had a cement floor with a urine runoff channel. They would collect that and manure to fertilise the fields. The urine was taken out in a wooden tank wagon, which always leaked, and drawn by oxen taken out to the fields. You could smell them coming! The town was extremely clean, however, and the buildings very well maintained. The center of town had a large square, dominated by Saintgeogskirche, St. George's Church. It was quite an imposing structure built in the old European cathedral style. There was a mummified body of a saint under glass on one side. It was a Catholic church, but there was a Lutheran church elsewhere and another catholic church, albeit a very small one. Fr. Ciupka celebrated mass in the cathedral but later we were moved to the little church. The small one was probably an 'original' structure. It was right beside the wall and was well sunk into the ground. Fr. Ciupka also held catechism classes for us kids and taught me prayers etc. Education for the kids was on the adults' mind and soon we had to go to school. My dad was, of course was made a teacher, as was George's father. My father was anxious, I guess, not to seem to be favouring me among the class, and went to the extreme opposite of blaming me for all problems. George's father was on the rough side. Whoever taught us history and Latin was fantastic, and I would look forward to his classes. We were also taught Greek mythology. Last, but not least... what a hat! Zenia thinks she is pretty cool! One day all the kids got a shoebox-sized parcel from the American Red Cross. These were put together by kids like us in US public schools. These were boy/girl specific, but someone did not notice, or didn't care, and I got a girl box. In it was a pencil or two, some Adams Spearmint and Juicy Fruit gum, a couple of berets for hair (this was a girl box! ), a black leatherette folder that could be used as a wallet or something, perhaps some other stuff, and an Air Mail reply envelope listing the names of the kids who contributed this stuff, their school class and so on. Mine had come from a school in New York State. All we kids were gathered for writing a thank you note in English in these reply envelopes, but it did not go very well and I never did finish, or mail mine. I think of that now and again when I think about Europe. I wish I had. It was a real treat to receive that package! I was signed up for violin lessons, then piano. I had a problem with that as I would rather be out fishing with George. We were inseparable. There was some gang warfare with the German kids, and we had our turfs. If you were alone in theirs you could get banged up, at which time you got your gang together and chased them. I visited my first dentist in Dinkelsbuhl! I guess I needed some fillings. The drill was operated with a foot pedal, like an old sewing machine, which instilled a lifelong fear of dentists, and contributed to my losing many teeth through lack of dental care. Flashlights were a big thing. We all had to have one, and were always going to the electrical supply store (he had a vacuum cleaner displayed in his window, not unlike our old Electrolux Arrow) for more bulbs. They were probably the wrong size and thus burned out quickly. There was a large yard behind our inner building and full of logs for our winter wood supply. We climber over these and a flashlight was certainly handy at night. While playing with batteries I discovered that the plastic things I had, with two wires sticking out would blow up if connected to any battery terminals. They could have been detonating devices for explosives. They were about two inches long and a little thinner than a pencil. They seemed dangerous so I did not keep that up! I spoke with Andy Kennedy (ex-Kacinik), my friend from high school. He and I were the swimming stars in class. Andy says he played with these as well as trying to set off cannon shells etc. He is amazed he was not killed. They would climb tall farmers' racks for drying hay and drop explosives to the ground in an effort to make them blow up! They also had a small bomb hit their house in Yugoslavia. Everyone kept rabbits and we had to go pick grass for their food. There were a couple of stage extravaganzas put on. This is where the joke about "Laugh three times and walk off stage" was interpreted to be lines, instead of instructions. There was also a masquerade, which was a big do with an orchestra playing and so on. Someone had lost a sanitary napkin and some of the dancers were kicking it around. Really high class! I became a stamp collector and dealer. We were getting mail from my father's sister Zenovia Wosowich in Saskatchewan and I was getting Canadian stamps, of which there were not many around. I had trading power, then I found that I could sell them to the German kids. Everyone collected stamps, and they played piano. There were at least two stamp dealers in town and we would look at all the great stamps in the window. When I gathered a little money I bought stamps at the stores and sold some of them to the kids on the street at a profit, which enabled me to buy more stamps. They are here! O ne of the camps, a small one, was in the Goldene Hirsch (Golden Stag), a little hotel/inn on a side street, with a stamp store beside it. In the GH attic I found bags and bags of quarter sized coins from Hapsburg days. There were enough for a Brinks truck. Could have caused a glut among coin collectors today! Close to this hotel was a theatre-type room on a second floor where movies were shown. I may have seen "The Five Sullivans", or whatever it was called - the story of five US sailors, brothers, who all get killed. It was a famous, true story. I do remember "Der Kleine Muck", a children's story a la Walt Disney, with boy and girl heroes. She was tending a flock of geese. I remember the theme song. I believe it was in colour. They also showed "Welt in Film" (World in Film) newsreels, and I remember the theme music from that. I had a bicycle, which was great. We built scooters out of a couple of planks. A plank to stand on, with a wheel at the back, another to be at the front, vertically, with the second wheel. You would push yourself with the free foot to get speed, then coast. This we called a hulainoha or 'dancing leg' in Ukrainian. One pastime was to "walk" a bicycle wheel rim, without the spokes, with a stick. Pushing the rim with the stick and alternating sides to steer it. A "hoola-hoop" type of thing. The other was playing "sticks". Dig a little hole in the ground, bury a piece of stick in the dirt across the hole, then place another stick across that one to form a teeter-totter kind of thing. Strike the teeter-totter with a long stick to make if fly. The guy that sent it the furthest was the winner! To make a whistle, you cut a piece of willow half an inch or so thick. Square up one end and cut a piece out on the side, like half a curved 'v'. This is where you will blow. On the opposite side, cut out a small (1/4") "thumbnail" hole, going into the wood. An inch or two past that, do a circular cut around the stick going through the bark to the wood inside. Now, using the back of the knife handle, hammer the bark all around. This separates the bark from the wood. Hold the stick in one end, clasp the loosened bark, and twist, sliding the bark off the stick. Trim a piece off the mouthpiece end to plug that end, first shaving a little wood off the opposite side from the 'v' cut and insert it into the bark tube, then cut a plug of wood to seal the front end. Presto! Not my favourite, but we did play a modified kind of baseball. American influence! Some soccer occasionally, but I was not a sports fan then either. One day there was a 'seniors' soccer match and my dad participated. Somehow I got my hands on a little brass steam engine. A little fire and water would make it run. It did not drive anything, just ran. But it was fun. We went on a family trip to Garmish-Partenkirchen to see the Alps and went to the top of one mountain in a cable car. The air was very thin and there were poppies growing everywhere in colours I had never seen before, or after. The view from the top was spectacular. We either visited or went through Berchtesgaden where Hitler had his mountain fort. We had been waiting for our application, sponsored by my father's sister in Glaslyn, Saskatchewan, to emigrate to Canada. One had to be sponsored to come here, and she was doing that. 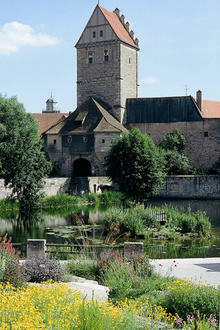 One day, word came that we were to go to a processing centre near Nurnberg and off we went. We stopped in Nurnberg and went to the zoo. It had to be spring because I remember pink magnolia blossoms on the trees down one whole street. The houses along this street were much like the little bungalows in North Toronto, with lawns at the front. The clearance centre looked like ex-army barracks. The US Army actively ran the camp, with armed guards at the gate. They were all wearing the little .30 calibre carbines (not the M1 .30-06) with extended skeleton magazines and shiny brass ammo showing through. This was neat! There were always some Jeeps parked on the road outside and kids hanging around the US soldiers just like the Korean kids in the television series M*A*S*H* some years ago. I passed by occasionally, but did not 'participate'. They starved us here. All I remember to eat was a milky soup with pieces of what looked like spinach floating in it, and not much of that. It had no taste. There probably was a bit of bread to go with that, but I don't recall. I do recall going through our luggage looking for something to eat, and roaming the fields around looking for root crops to steal. I was hungry all the time. Very likely there was lots of good food sent to feed us, but it was sold by a crooked administration on the black market. I had a little folding "Esbit" brand stove, about the size of a large Canadian cigarette package, which was fuelled by little Esbit fuel blocks, but there was nothing to cook. I've seen these little stoves in Canada. The buildings were three or four stories high and had large rooms off corridors on one side. The rooms were full of army cots for us to sleep on. Twenty, thirty, forty, I don't know, beds to a room. There was no privacy. Those that wanted privacy headed to the attic, and left remains there. Some of the 'men about town' would occasionally blow up 'balloons' and throw them out a window to float in the breeze. I found some of these in the attic and blew them up. I shudder at the thought now! They were not new. We were fingerprinted, X-rayed, examined and all that. People were leaving constantly, via train and headed to Venezuela, Paraguay, Uruguay and elsewhere. It was easier to go to these places. My sister says now that someone stole my X-ray photos with tuberculosis and we were turned down on coming to Canada, then after my aunt's intervention, went through the process again. I do remember doing it twice, but don't remember leaving and coming again. I do remember that I could go to the US "PX" army store and buy a package of Camel cigarettes for two marks. On the street it was easy to sell each cigarette for two marks, and I soon had a thriving business going. But obviously I should have done so on the sly! The US MPs grabbed me, hauled me in front of my parents, and made a big issue of my business. They threatened to cancel our processing! All that was sorted out, I was not punished, and soon we were heading to Bremenhaven to board the SS General Stewart heading for Halifax, NS. Bremen was quite nice, the commercial fishing docks were quite orderly and nice to stroll around, and there were commercial fishermen selling some of their catch. The dock where our ship was, was a mess, but then they had been getting shot at just a few months earlier! We sailed on September 5, 1948. Olga Kaczmar was in Dinkelsbuhl in 2006 and came back with these photos of the rennovated building #52 Nerdlingen Strasse, which housed Ukrainian DPs. TOTAL 6081 persons of different nationalities were mentioned. Soon this high number of people was reduced by transporting a lot of them to other DP camps in the neighborhood in Bavaria. TOTAL 627 persons were registered. Weisses Ross (White Horse): Here were the Lettish DPs. Here were accommodated the Lithuanian DPs. Here lived the Ukrainian DPs.